Somewhere in the grey area between stereotype and awesome character lives a nice Korean girl named Lane Kim. 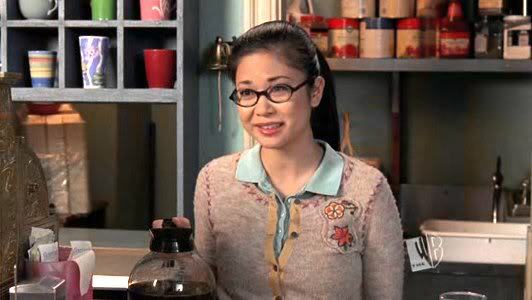 She's a fantastically feminist and complex figure on a show filled with awesome ladies and yet simultaneously a stereotype about the Asian best friend with her restrictive parents, weird food, and life that never overshadows the main character even for a day. Depending on how you look at her, Lane Kim is either very bad or very good for representations of Asian-American women. Or, if you're willing to stomach the complexity, she's both at the very same time. Like most girls of a certain age in the early 2000s, I feel like I grew up in Stars Hollow with the girls of Gilmore Girls. I had a crush on Luke (didn't everybody? ), envied Rory's revolving door of attractive boyfriends, and desperately wished I could pull off even half of Lorelai's wardrobe choices. 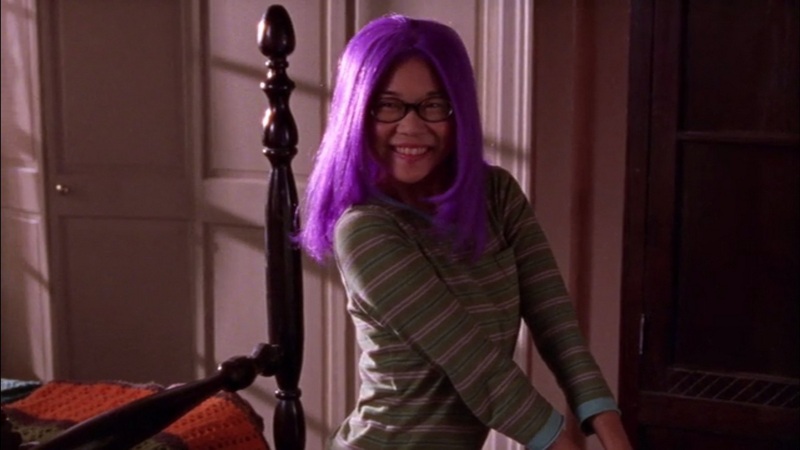 But while I always wanted to be Paris, one of the characters I hands down related to best on the show was always Lane Kim, Rory's hometown best friend and number one fan. Introduced in the pilot episode, Lane Kim (Keiko Agena) is one of the major characters of the show, even if her role did get cut down in later seasons. Rory's childhood best friend, Lane grew up in a restrictive religious household. Somehow she still managed to fall in love with rock music and dreamed of being a musician. Eventually she was able to sneak her way into learning to play the drums and became a drummer in a rock band, much to her mother's stone-faced disapproval. While Rory was off at Yale making bad boy-decisions and living it up, Lane stayed in Stars Hollow, working at Luke's Diner and a couple of other lowkey jobs, playing with her band, and slowly falling in love with one of her bandmates. They got married, had twins, and by the end of the show seemed settled into a quirky but loving family unit. Like I said above, there's a lot to love about Lane but there's also some stuff that bothers. 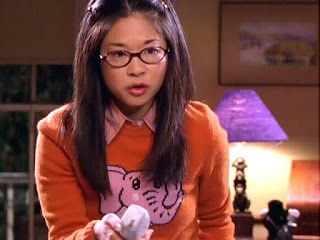 This division becomes even more noticeable when we analyze Lane in terms of her position as one of the only Asian-American women represented on primetime television in the early 2000s, let alone one of the only Asian-American teenagers. Perhaps the first note we should make, then, is that Lane is the best friend and the supporting character, but she's not the lead. 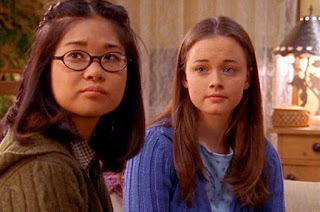 Gilmore Girls, for all its merits, is not a very racially diverse show, and it seems there was never any inclination for the leads to be non-white. So Lane from the beginning fits into a pervasive and frustrating stereotype, that of the Asian best friend - the character who's there to make the story feel more diverse, but not to take any attention away from the white lead. This racialized power imbalance is exacerbated by the show itself. Lane is always secondary to Rory, even in their actual relationship. Lane's problems nearly always get second fiddle to Rory's problems. Lane's life is wrapped up in Rory's life. And when Lane, missing her best friend who has moved on and somewhat left her behind, finds her own life and interests in Stars Hollow, Rory is hurt and upset and refuses to understand. In other words, while Lane gets a story here and there that's all hers, the majority of her plotlines are centered on Rory or used as filler when Rory's not around. Lane as a character rarely gets to take center stage on her own merits, and when she does it's almost always for a very stereotypically feminine event. Like a boy problem or a wedding or a baby. That kind of thing. Yet despite all of this, Lane is actually one of the better representations of an Asian-American woman that we get to see on television. Because of how we're centered on her life in Stars Hollow, we see very specifically how Lane feels about her culture and background and how it influences her going forward. Lane isn't generically "Asian", she's from a specific nation and wave of immigrants. Her parents are Korean Christians, particularly Seventh Day Adventists, and very devout. Lane's culture isn't handwaved away or generalized into some kind of vague East Asian blur, it's clear and present and a major factor in her life. And a lot of Lane's story is about her struggle to integrate her background with her life in modern America and her love of modern American culture. So in that sense Lane is awesome. She's a clearly defined Korean-American girl trying to compromise between parents she loves but doesn't understand and a culture that says that a girl, let alone a Korean girl, can't be a rock musician. She loves a culture that doesn't love her back and we frequently get the feeling from her that she doesn't feel like she fits in anywhere. Not really. It's not until she's able to carve out her own little place in the world, playing in her band and making her own community, that Lane seems to really find herself at peace and settled into herself. This is the part of Lane that I find most compelling, honestly. The idea of being a person who wants to rebel, but who's too scared and loves her parents too much to rebel openly. Lane hides CDs in Rory's room because she loves this heathen music, but not so much that she wants to destroy her relationship with her mother to listen to it. She fluctuates between wanting to pretend that everything is fine and railing against her parents' expectations of her. Lane isn't particularly religious, but she understands how important religion is to her family. It's the painful balancing act of anyone who finds themself fluctuating between parents who they love and a future their parents can't understand. Lane's insecurity and bravery and freakouts are what make her a character I love. I love that she is bold enough to decide that she wants to dye her hair bright purple, and I feel for her when she backs and realizes she can't live with it and dyes her hair back immediately. I love that Lane manages to learn the drums and join a band and create this fantastic musical life for herself all on her own, but I feel for her so much when she finally has to face down her mother's hurt and sadness. While Rory is off falling in love with beautiful boys who have the world at their feet, Lane's romances with her bandmates are somehow realer to me and a little bit sweeter for it. She has this wonderful puppy-love with Dave that transitions into a grownup relationship with Zach. She might live a smaller life than Rory, might fall into Rory's shadow a lot of the time and get pushed to the back of the narrative, but Lane Kim is amazing. She's smart and funny and insecure and bold and awkward and the kind of real person you feel like you know almost instantly. I actually think it's a shame that Lane didn't get her own show. I feel like she would've been awesome as a lead. 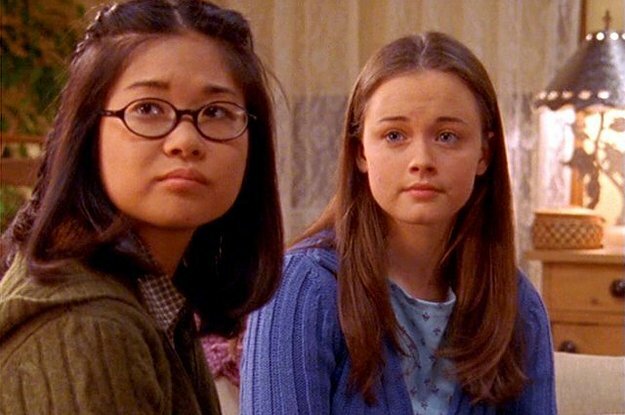 This is all not to say that I don't love Rory and Gilmore Girls as it is, but rather to express that I wish it could have been more, you know? I love Lane, and I would have loved even more to see her really allowed to come into her own, instead of getting ten minutes every three episodes or so. Instead, what we get is a complex and fun and cool Asian-American teenage girl who spends almost all of her time thinking about her white best friend and her white best friend's problems. There's a reason why I picked Lane Kim for the first Strong Female Character Friday article of Asian-American and Pacific Islander Heritage Month, and that reason is the duality of her representation. The frustrating push and pull of "awesome complex character" and "best friend sidekick" that hampers Lane's development. In a lot of ways, I think Lane stands in for the larger issues of Asian-American female representation has gone on television and in film. There's a tension there, a tension that is only now starting to come to the forefront. While African-American characters are saddled with centuries of racist stereotypes and Arab-American figures are pushed relentlessly into roles that paint them as terrorist villains, Asian-American characters have had a very different issue: Invisibility. Lane isn't invisible, and for that we can be thankful, but she's also not a lead or even as popular and given as much screentime as the white secondary characters. I mean, Jess almost got his own spinoff for crying out loud, but Lane barely got an episode a season where her problems trumped Rory's. Even in cases of good representation, like Lane, there seems to be a block in our culture preventing us from viewing Asian-American stories as ones that deserve our attention. Lane Kim is awesome, yes, but she's also kind of invisible, and that blows. Especially since she's the kind of complicated, accessible, kind, loving, and hilarious character we could all do with more of in our lives. Seriously. Lane Kim for the win. *She's angry, driven, intense, and refuses to feel bad about not fitting into the stereotypes people push at her. But underneath all of it she's actually really kind and compassionate, just in a super no-nonsense kind of way. I'm not saying that I am Paris Gellar, I'm just saying that I'd like to be.